20. The Legend of Zelda: Tri Force Heroes: The first hint something isn’t quite right is the name. “Wait,” you say, “I thought Triforce was one word?” And you would be right. This legendary symbol, the fragmented Holy Grail of the Zelda series, is no longer a treasure to be found but a word split in two for punning effect. You play alongside two other heroes—you are a Tri Force—to work together, solve puzzles and defeat treacherous baddies. Instead of items and crests, you unlock new outfits to wear. 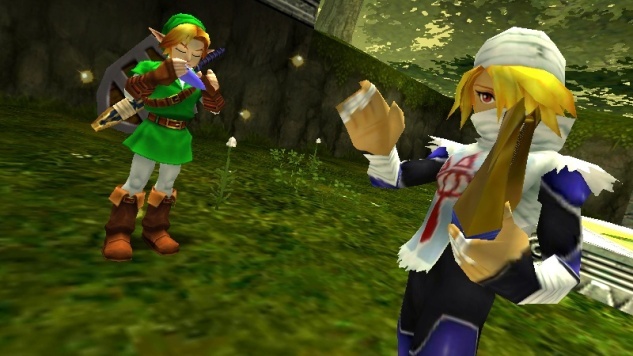 Though many provide special skills, the attire itself is often worth the trouble: Seeing Link prance in his pajamas or sashay in a dress is, admittedly, more interesting than another hookshot (though it’s too bad Zelda herself couldn’t fight alongside you instead of two clones). 14. Zelda II: The Adventure of Link: The first sequel in the landmark franchise had a weighty burden to carry. This was the first Zelda game I played back when it came out in 1988, and so my opinion of the series was unfairly skewed by the title’s idiosyncrasies. A mix of RPG trademarks, such as random battles and experience points, melded with a side-on perspective that confused veterans of the top-down original. Townspeople spat out spare hints that, if not heeded correctly, would make progress near-impossible. The elegance of the original was traded for a complex duality, between overhead maps and side-scrolling action scenes, that has yet to be returned to in the subsequent thirty years of revision. 11. Phantom Hourglass: Phantom Hourglass is the kind of game that would have been impossible to predict at the dawn of Zelda two decades prior. First, there’s the luscious cartoon look, mimicked from GameCube’s divisive The Wind Waker and developed into a style of choice for both of Link’s journeys on the DS handheld. The more surprising development to the player circa 1986 would be the interface: in lieu of using buttons to attack, you wield your weaponry by swiping the stylus on the bottom touch-screen. 7. The Legend of Zelda: Ocarina of Time: The last time we saw Link, he was a chubby blob of pixels seen from a mile up. Now we watched from eye-level as he walked through open pastures, ran across floating logs, and rode a horse. I recall observing a college roommate running through Hyrule Field, his face slack, his torso unmoving. My friend’s grades suffered that term. But we, the players, did not. As the industry stumbled into three dimensions, Ocarina of Time was Part Two of Nintendo’s jab-uppercut combination that, along with Super Mario 64, brought everyone else up to speed as to what polygons made possible. 3. A Link to the Past: For many, this is where it all finally came together. The original inspired with its scope and sense of freedom. The sequel flummoxed with its obtuseness and drastic swerve. Here, then, was a return to what worked before—an overhead perspective, with a reliance on the player’s wits and curiosity to push them onward—but with the juice of a new machine to reinvigorate the proceedings. Now, you could hear rain pounding on the roof overhead before stepping out into the storm. You burned bushes not with pixelated candles but flaming torches. Rooms had elevation; this was a layered Zelda experience, both vertically (in space) and horizontally (in time). What was merely hinted at in The Legend of Zelda was now seen fleshed out and fully realized. Just over a year ago Paste ranked every game in the Legend of Zelda series. It was a fine piece—smart, thorough and fair—but, in time, it has become somewhat obsolete, as these pieces tend to do. Something pretty significant happened in the last month to completely change the entire foundation of that older piece, and so we’ve felt the need to update it. And that’s what this is: the update, of that previous ranking, from just over a year ago, deep in the midst of the pre-Breath of the Wild era. These thoughts are as crucial as the arguments they’ll probably incite (and if you want to argue ‘em, go leave comments at our Facebook page or the larger, all-encompassing Paste Facebook page). So join us on an epic adventure through 31 years of Legend of Zelda and Legend of Zelda opinions, as we plunge ever deeper into danger towards an inevitable (and perhaps too-obvious) end.